neatComponents recognizes a distinction between allowing a User to edit a page and allowing that User to publish the changes. Approval Controls allow editorial control of changes before they are released to the public. 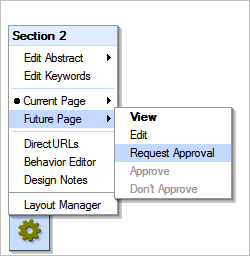 Approval Controls provide full editorial control of changes to be made to any page on the website. Editors have Approve – Disapprove control of proposed changes, and are notified automatically by email when an editorial decision is required. The comprehensive Behavior Editor controls give designers the ability to decide page by page who should make an Editorial decision. So, for example, decisions about a proposed press release need not be made by the same editor in control of product information. Once set up by the website designer, the Approval Controls work completely automatically, requiring no action by the Contibutor - it is impossible to 'forget' to get approval for a submission. This means that it is possible to delegate the editing of a part of a website to say, the secretarial support team, whilst still keeping control over whether the changes are made visible to the outside world. An editor has to allow the page to be published. This control is available on all suitable components via the Behavior Editor - using just a single check box. Workflow Locking prevents two Users editing the same component at the same time. If one User has a component open for editing and another User tries to edit the same page they are prevented from doing so and a warning dialog appears on the second Users screen. Workflow locking allows teams to work on the same site without the danger of overwriting each others work. Workflow Locking prevents more than one user opening a page for editing at any one time, so preventing accidental loss of information. neatComponents reports the 'lock' to the User attempting to access the document, giving the name and email address of the current user, so that if necessary they can be contacted to release the page for editing by others. Site Administrators, and others with the correct permissions, can over-ride the Workflow Lock, and force changes should the need arise. In a busy website there may be many pages that need to be checked before they are released. To reduce the editorial burden of keeping trrack of pages whose publication is pending approval the webpage can be configured to send an email requesting Content Approval. All of the characteristics of the email are configurable by the site designer from within the system. There is no additional set-up or access to a mail server required.